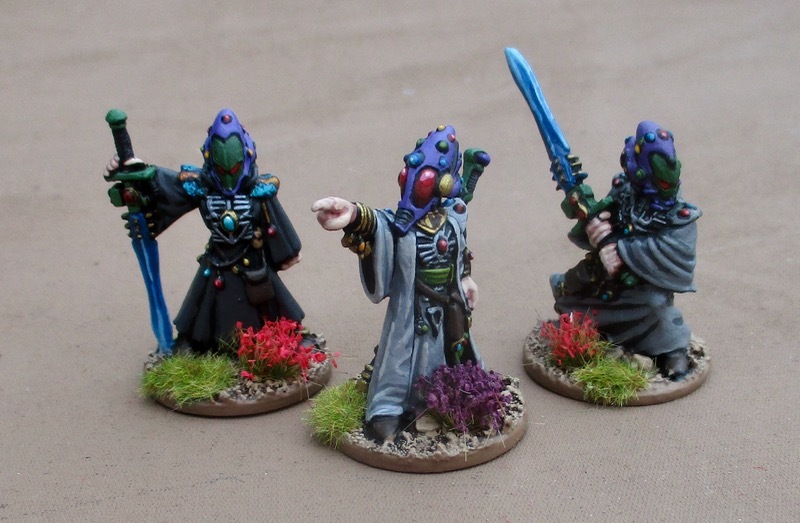 The Eldar were my force real force for Warhammer 40K. 40K figures weren't easy to get in Saskatoon, Saskatchewan, Canada in the late 80s but I managed to put together a small force of them. 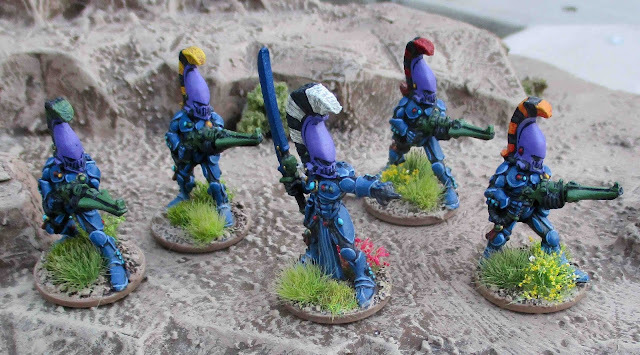 Probably only a few squads worth of metal guardians - but they saw a lot of action back in the day. I sold them all for $40 and have regretted the decision ever since. 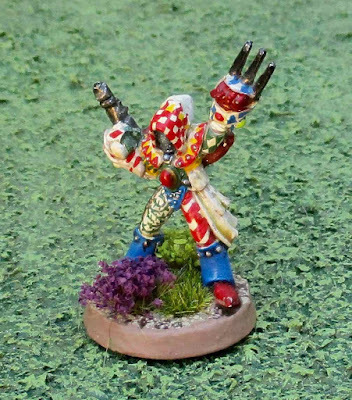 Thank goodness I hung on to my harlequins. 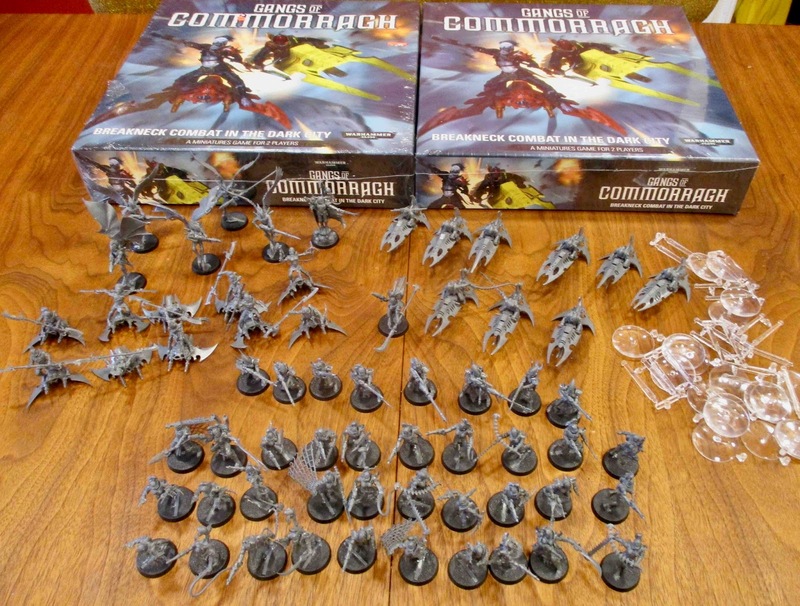 Over the intervening decades I have reacquired a number of the same miniatures - plus a fair few newer ones. 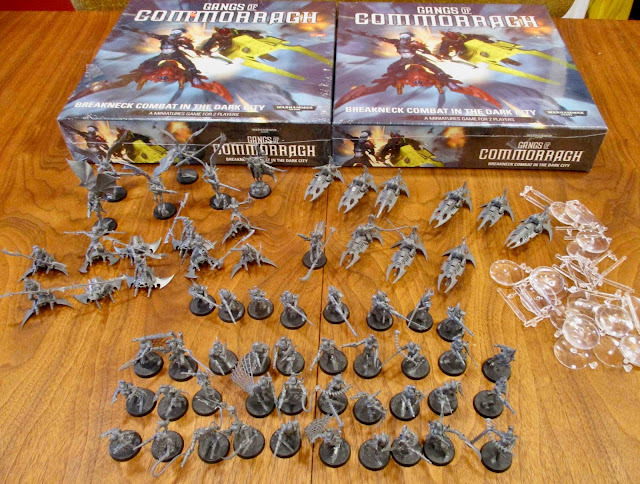 Now I have enough amassed to field and entire "Brigade" Detachment of Assuryani (Craftworld Eldar) - If I ever manage to get them all painted. More recently Amanda bought a force of Drukhari for me to paint for her to play with. A War Host of Assuryani from the Biel-Tim fleet - an offshoot of the Biel-Tan craft world. 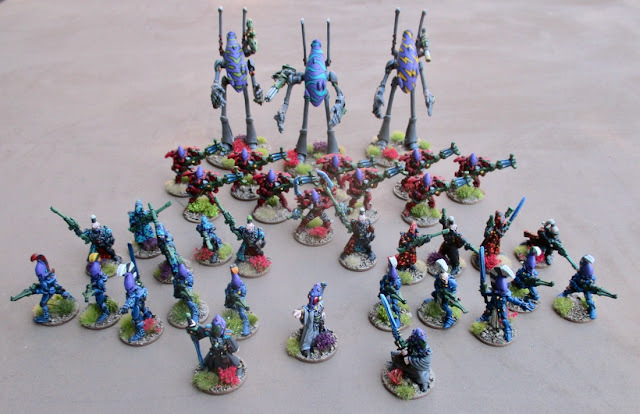 The fieldable force, so far; a "Battalion" detachment with a Farseer, two Warlocks, ten Dire Avengers, ten Rangers, ten Warp Spiders and three Wraithlords. Not pictures are the Autarch and four Dark Reapers. Asuryani HQ options - An Autarch and her Farseer and Warlock councillors. Autarch Xidrilliel of the Biel-Tim fleet. She doesn't often show up to lead a Battle Host, but when she does it is a mission of vital importance. 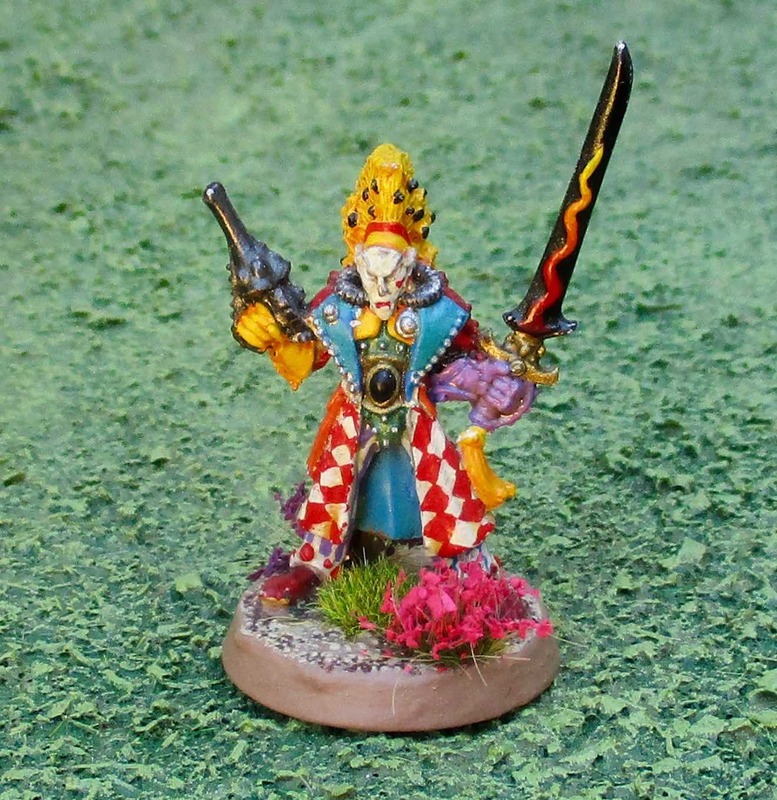 This Warhost of the Biel-Tim is usually lead into battle by Eldar Seers and Warlocks. 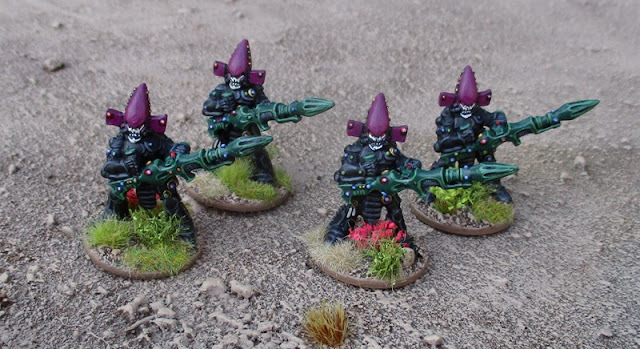 Almost a squad of Guardians (I finished them up for the Shadow War: Armageddon campaign I ran in February of 2018) I just need to finish up a weapon platform and crew to finish off the first squad. I should have three of these. The uniforms for all my guardians will be (mostly grey armour) with (mostly) Purple helmets - but the helmets might include some patterning or different coloured stripes to differentiate the squads from one another. One squad of Dire Avengers. I did the plumage/crests differently to more easily identify who was who in Shadow War: Armageddon. I'm not sure how I'm going to do the other two squad differently...? A different contrasting colour on the crests...? I have two more squads like this to finish up. Second squad of Dire Avengers. I currently have ten more Dire Avengers to paint up for a third, larger, squad. At some point it might be nice to pick up another ten to field three full squads of ten. I have one more squad of Rangers to paint up. 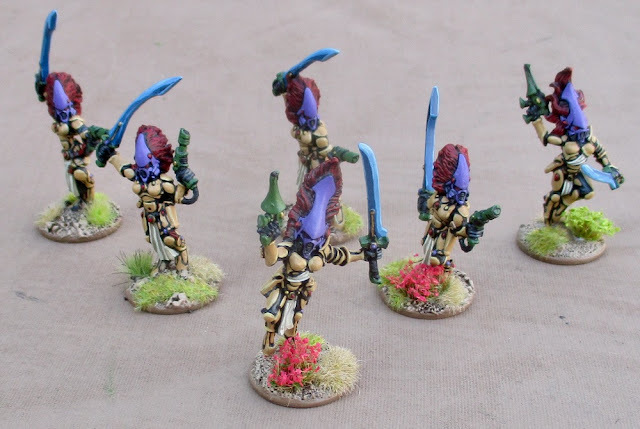 Howling Banshees - a mix of old and not-quite-so-old Banshee models. 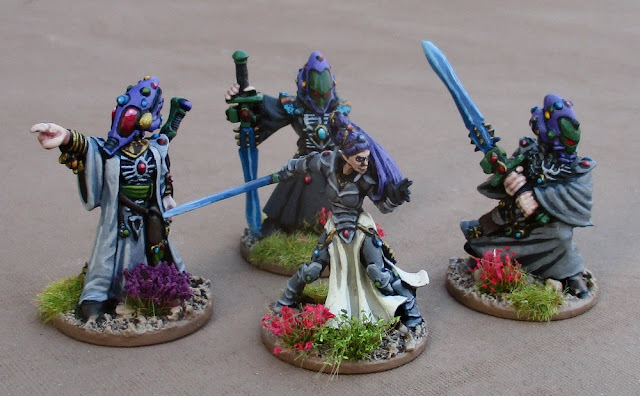 I still have an Exarch to paint of this squad. It would be nice to track down three more for a full squad of ten, at some point. I have another ten Warp Spiders to paint up for a second unit. I also have Swooping Hawks for Fast Attack options. I have a third I just need to finish up. I also have an old Armorcast Revenant Titan and a Tempest Heavy Grav Tank. Not sure what to field The Tempest as - as there are no longer any tanks like the Tempst in production. There is the Scorpion Heavy grab tank... which has a twin Pulsar cannon which looks a bit like the old tempest... 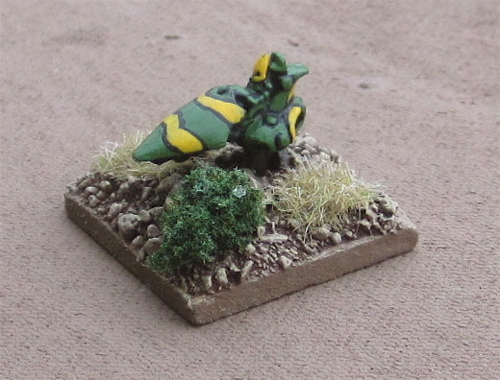 The Scorpion is a Lord of War and armorcast model is a lot smaller, though. If I were to field those I guess they'd have to go in separate Auxiliary Super Heavy Detachments... Unless I got a second Tempest or second Revenant - then they could be fielded together in a regular Super Heavy Detachment! I was originally planning to use these with Future War Commander. Each stand representing a platoon of infantry or vehicles. So this would represent about company sized detachments of Fire Dragons and Striking Scorpions - with their own organic Falcon AIFVs... 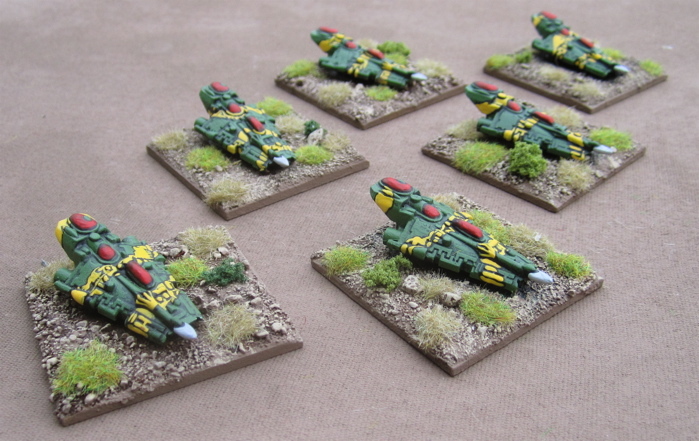 Some additional Falcons - with no infantry to carry about just yet. a couple platoon-sized groups of jet bikes - likely recognizance elements. 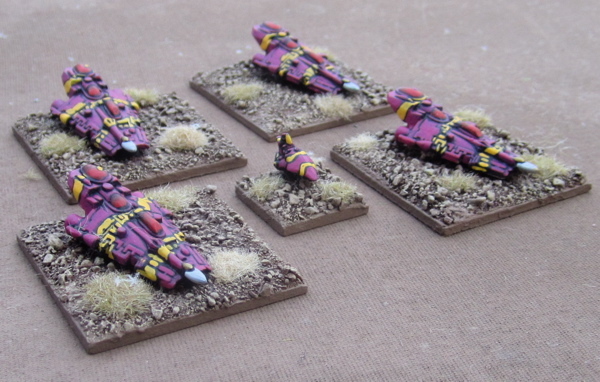 And some Warpsiders and allied Harlequins. A large company-sized force of Striking Scorpions. Dedicated transport for he above Striking Scorpion aspect warriors - Falcon Grav "tanks". Despite being referred to as "tanks", they do have the capacity to transport infantry, so I think of them more as AIFVs. A Headquarters Element for the above Striking Scorpions. Dedicated Transport and HQ element for some Fire Dragon aspect Warriors. Three Warpsider aspect warrior elements with an HQ Element. I have loads and loads of Guardians and Falcon grav tanks to do - as well as a few more aspect warriors and other stuff. 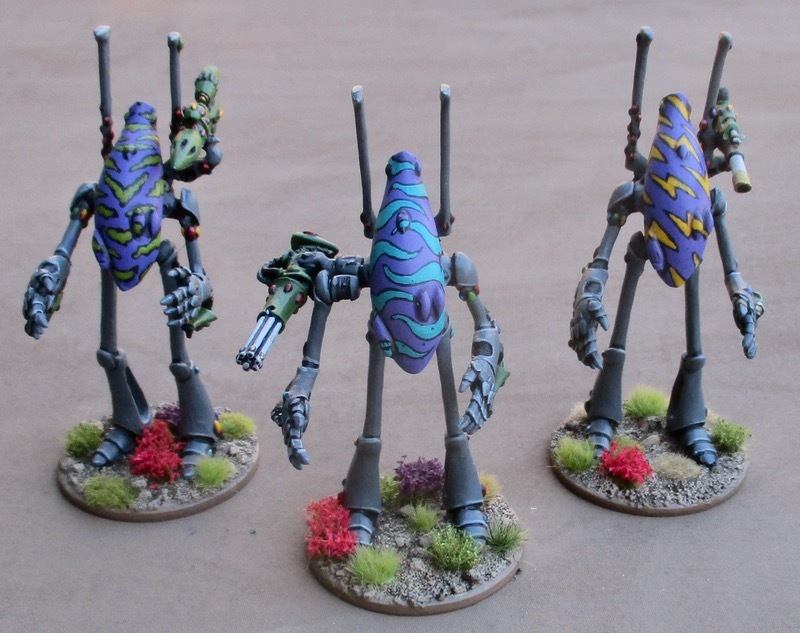 I also have THREE Eldar Phantom Titans and two smaller Revenant Scout Titans (though they are not the same style as my larger 28mm Armourcast Revenant Scout Titan). These are some of the oldest minitures I own with their original paint jobs. The Original force. 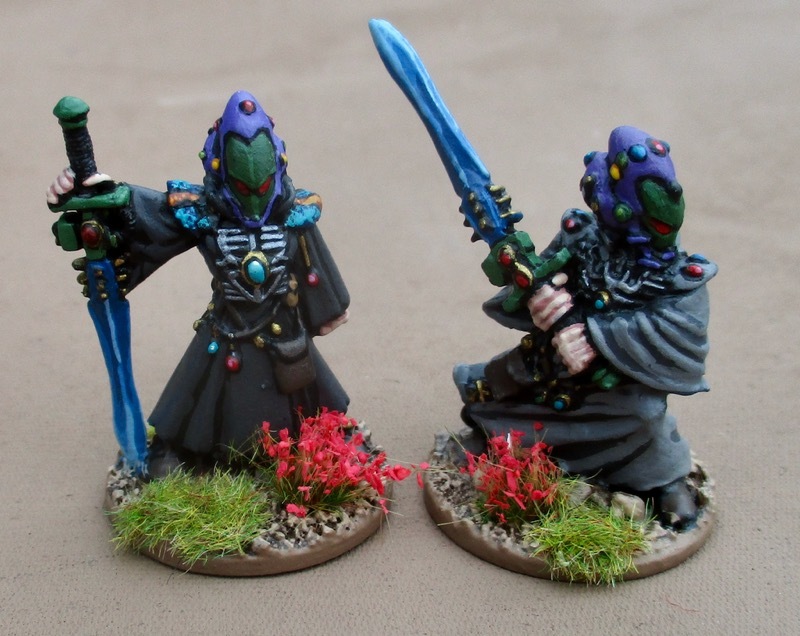 I painted these over 20 years ago. Not bad for teenage Tim. Finally the Troupe. 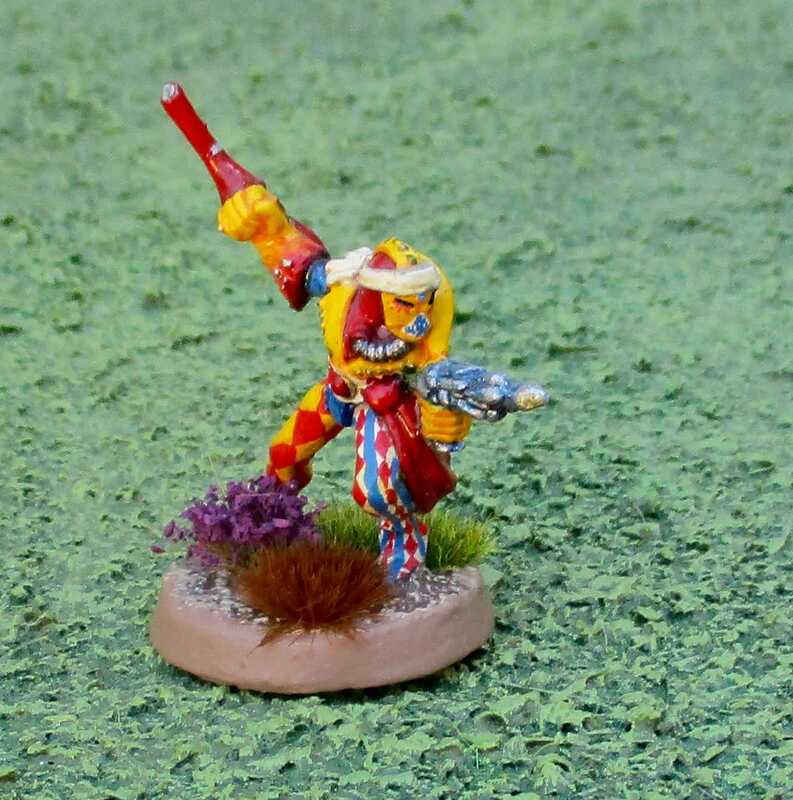 Most are armed with a Shrunken Pistol and a Harlequin's Blade. One has a Fusion Pistol and a Harlequin's Kiss, another is sporting a power fist - which aren't allowed anymore so I called it a Harlequin's Embrace as it was close to the power fists stats... Power Level 6 - Troop. Currently this force could be fielded as a Vanguard Detachment. If I added two more Troupes I could field it as a "Battalion" detachment and get a few more Command Points! 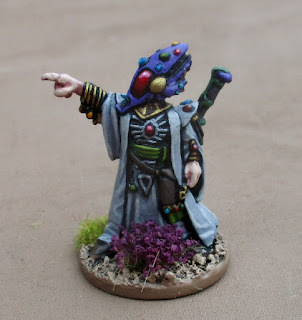 The Dark Eldar of the city within the web ways. 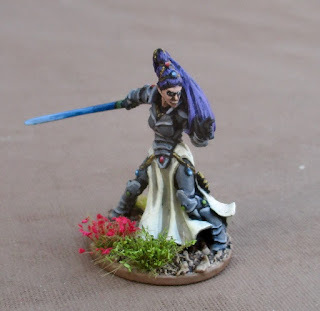 In spring of 2018 I saw a complete force of Drukhari posted for a price I just couldn't walk away from and picked them up to put together a force that Amanda could play. So far, I have only managed to finish up a Kill Team worth of them. Kill Team of the Crimson Wave Wych Cult. The only thing I don't currently have is the Venom transport for the Succubus in the Outrider Detachment. 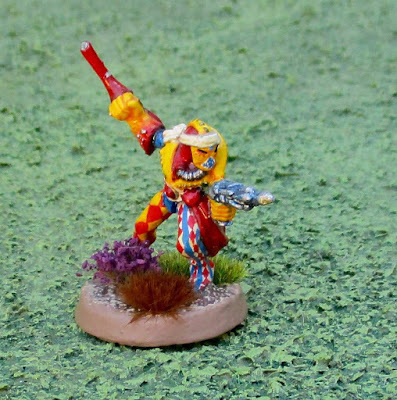 I'm in no rush to pick it up, however, When I get the Battalion detachment done and start thinking about painting MORE Hellions and Reavers... then I'll worry about tracking down a Venom!